Up until 1997 I had eaten very little Mexican food, but when I moved to Denver I learned to love it. I never did get used to the spicy heat and I've made more than one person laugh as I struggled with eating something that they considered to be mild. I never minded their laughter and teasing! Now, I'm moving to Canada which is not a hot bed (pun intended) of great Mexican food. I'm sure that you can probably find a good restaurant there, but I'd really like to learn how to cook authentic Mexican cuisine at home. I'm talking about the basics, not the stuff you might get in a fancy-schmancy restaurant. 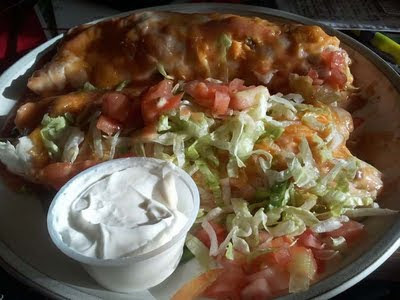 I'm looking for home-style cooking: smothered burritos, tacos, guacamole, salsa, quesadillas, that kind of thing. Smothered burritos from El Parral in Centennial, CO . This location is now closed but there are 3 others. So, now I'm looking for help. If you have a great recipe that you can share with me, or know of a really good cookbook with the kind of food I'm looking for, please email me or leave a comment. Denver has many wonderful Mexican restaurants so I never learned to cook anything myself. I never had to. Now, I'd really like to take a bit of the real Mexico to Canada. When Amy Singer was here in L.A. teaching at our guild the number one request she had was to eat Mexican Food. (Amy lives in Toronto). One of the places I took her was to the very famous Mexican fast food joint "Tito's Tacos". I'm not sure how long they have been there but I remember going there before they moved which was in the 60's. I LOVE Mexican Food and cook it and have it often. Have a great "move"! I'm sure you will love being near your children. Come to Southern CA and visit us, plenty of Mexican Food here!